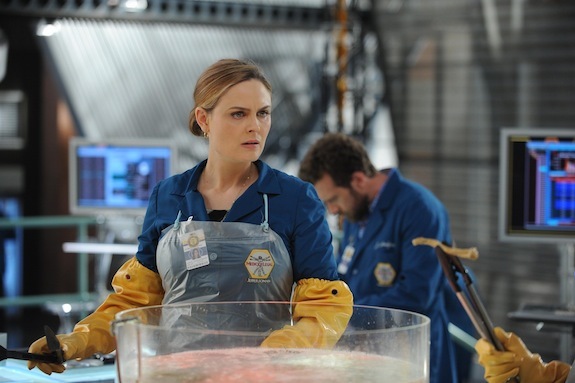 Give Me My Remote > Bones > BONES: ‘The Puzzler in the Pit’ Photos — Daisy Gives Birth! Ahh, that’s gonna be a heart breaker. :(( Poor baby Swaisy. Every episode of Bones is awesome, I’m here at 7:45 PM Eastern time waiting for Bones to come on at 8:00 PM. The episode The Puzzler in the Pit sounds exciting, I didn’t at first like Daisy, but I like her now, I went back and watched previous episodes with Daisy in them, and she was quite funny. Bones was great has always cried when Daisey had her baby glad they were all there for her .